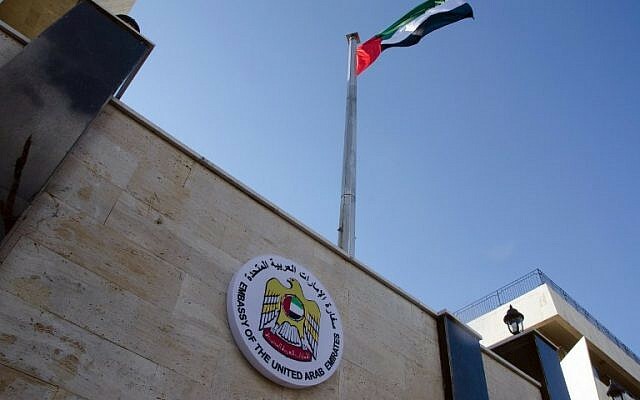 DAMASCUS–The United Arab Emirates reopened its embassy in Damascus Thursday, the latest sign of efforts to bring the Syrian government back into the Arab fold. Nearly seven years later, the Emirati flag was raised again during a ceremony attended by diplomats and journalists. An acting charge d'affaires has already started working, an Emirati statement said, stressing that the UAE was "keen to put relations back on their normal track". A few hours after the UAE's announcement, Bahrain signalled its intention to reopen its embassy in Damascus, which has been closed since March 2012. The Gulf state's foreign ministry said it was "anxious to continue relations" with Syria and wants "to strengthen the Arab role and reactivate it in order to preserve the independence, sovereignty and territorial integrity of Syria and prevent the risk of regional interference in its affairs". The conflict has now killed more than 360,000 people. Assad's seat at the helm, which he inherited from his father in 2000, appeared to be hanging by a thread until Russia's 2015 military intervention turned things around. The past few days have seen a flurry of diplomatic activity that looks set to continue until the next summit of the Arab League, due in Tunis in March. "Recent discussions on this issue have not yielded a consensus," Hossam Zaki, the League's deputy secretary general, told reporters in Cairo on Monday. "This does not rule out a possible change of the Arab position in the future," he added. Ali Mamluk, Syria's intelligence chief and a key figure in the Assad regime, travelled to Egypt last week on an official visit. A Cham Wings Airlines jet completed the first flight between the two countries since 2011. "This trip is the reopening of tourism links between Syria and Tunisia," Moataz Tarbin, the head of the tourism firm that organised the flight, told AFP. It is not yet clear if more Arab countries, several of which were accused by Assad of once supporting jihadists and rebels, will follow in the UAE's footsteps. The UAE and Bahrain are two of six Gulf Cooperation Council nations that took a tough stance on Damascus in 2012 and eventually recognised an opposition umbrella group as the representative of Syria. "An Arab role in Syria has become even more necessary to face the regional expansionism of Iran and Turkey," UAE Minister of State for Foreign Affairs Anwar Gargash said on Twitter. Tehran has been a staunch supporter of Assad's government and has expanded its military footprint in Syria throughout the course of the conflict. US President Donald Trump claimed on Monday that Saudi Arabia, Iran's regional arch foe, had agreed to finance Syria's huge reconstruction needs.